International cultural, educational and entertaining event which unites artists and meetings of amateur groups. 4 different festivals with the same vision! Do what you love, connect, meet new people, PERFORM! 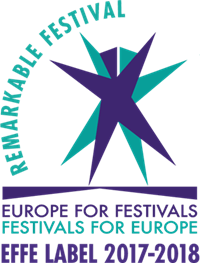 FAKS festival is proud to be recognized from European Festival Association (EFA) and chosen to get EFFE label for 2017/2018 as one of the best European festival. EFFE quality label was given to festivals with an artistic commitment,involvement in their local communities and a European and global outlook. "We enjoyed all the time on FAKS festival and learned a lot which of course is the meaning of this event. You were all wonderful and the organization team is great. Our guide Ivana was charming, a truly wonderful guide. You were are all very friendly, thank you." "We have wonderful memories from the days we spent in Croatia at the FAKS Sings festival. A great experience, first of a kind for us. We met other choirs and we will try to be in touch with them for new cultural exchanges." We had a great time at your festival. We felt friendship and positive energy in the air and we saw that you are doing FAKS festival from your heart. There were good concerts, meetings, new friendships and delicious food. In the name of our choir, THANK YOU for everything. "The organization was excellent in every aspect. The program was varied, diverse and in accordance with the terms of the participation form. There was an interesting discussion at the round table, we met a lot of choirs and shared experiences." "Quality and selection of the program was ok. I expected more choirs from all around Europe. Maybe it would be better if one guide accompanied one choir group and translate in their language. The accommodation and cleanliness in the Belvedere resort was perfect." "I would like to say thank you for the possibility to take part on your wonderful festival from 05.-08.05.2016. All the boys are still so excited, they can't get rid of the deep impressions they could get in Istria. Thank you for the kindness and hosptality. I hope we can keep going on cooperating in the future." "The organization of the festival was great. We had wonderful time on the FAKS Sings festival 2016. The program of the festival was very interesting and we had a lot of fun." "Great organization and interesting festival Schedule. We thank you for these beatiful days we spent here in Istria at your festival. We wish you a lot of success at organizing future maifestations." "Participation on the FAKS festival in 2016. was one of the most positive experiences for our choir and the group was very pleased. The guides were profesional, kind, punctual and always available, very well prepared. The accomodation was clean, comfort and modern. As I said to the president of the FAKS festival, I will contact other choirs and tell them about FAKS festival. " "All positive – the town is nice and clean, very interesting program of the festival and great organization, congratulations! We really enjoyed participating on FAKS festival 2016." "The festival was outstanding in every aspect. I never attended to such a demanding event where everyone was happy and no one complained. Excellent and evocative places of the performances. Compliment to the organization team. We hope to come again to FAKS festival." "The idea of the festival is excellent and I would like to commend the organization and the hospitality of the hosts who welcomed and accepted us in a very friendly manner. The festival is an excellent opportunity for choirs and groups from all the regions to meet and interconnect, and spread the joy of amateur music and singing beyond the borders of our country." "The first event of FAKS 2014 was a very positive experience in all regards: excellent organization and concert area; Rovinj is beautiful... All the singers contributed to this meeting of the choirs with their love for choir singing, and, although they were amateur singers, they tried to meet the basic elements of quality and even artistic singing." "We love the idea of FAKS, the socialization of amateur choirs, interconnections and exchange of experiences, and we strongly commend the organization since it was the 1st FAKS which also included choirs. We were especially thrilled with the accommodation and food." "It was our great pleasure to have participated at the 2014 FAKS Sings Festival in Rovinj. We had such a good time that we will be back. It is an experience we wish to recommend to everybody because festivals like these enhance the relationships between choir members and their escorts, and generate memorable experiences." All events will take part in beautifull Istrian Peninsula. We will together discover some of the best Istrian destinations, such as Rovinj, Vrsar, Pazin and more. Our staff will contact you as soon as possibe.